Describe why you entered into discernment for the religious life or when you heard the call from God. Having been introduced to the Catholic faith from an early age from my parents and family, I began to sense that God has called me to the priesthood, although I didn’t know it. I attended Mass with my family, retreats and other events that played a key role in hearing God’s voice. When I heard those words and I looked at the host, I realized that it was no longer a single piece of bread, but it was the living Christ who was there, who gave his life on the cross for us. At that moment he touched my heart and put in me a desire to be his fisher of men. I experience a lot of joy and peace when I look at Christ in the Eucharist. Through time and prayer, I decided to be a priest because I know that we need food for our souls, and through the priest, we are able to nourish our soul with the Eucharist. I feel Christ has called me to consecrate the host into his Body and Blood, so that we can have food for our souls. My family played a key role with my vocation. I came from a very devout Catholic family. Mass was one of the things that we did and do every Sunday. I used to attend Bible class, my aunt taught me catechism and we used to pray the rosary together as a family. I believe that almost everyone in my family knew that I had a vocation to the priesthood. It was my father who said that he thought the priesthood would bring me happiness. In addition, my grandmother guided me to be close to the heart of Jesus as I witnessed her faith and her devotion to Our Lady of Guadalupe. When I discovered the beauty of what books could teach, I began to read books to prepare, and to know and serve God better. Reading takes me to new places and nourishes me with something new to learn. I also work out at the seminary. This is one thing that my father taught me to do. Not only is it an effective way to stay healthy, but also it clears my mind from any stress that I may have here in the seminary. Working out has allowed me to make new friends and has helped me to take care of the temple of the Holy Spirit. Being a seminarian is the best thing I could ever imagine. I have met so many wonderful people. I have been able to know and love God every day through daily Mass, praying the rosary and exposition of the Blessed Sacrament. It is really busy because I take classes like any other college student. But it is the best life that I can imagine, and through prayer and preparation, I hope it is God’s will for me to be a priest. 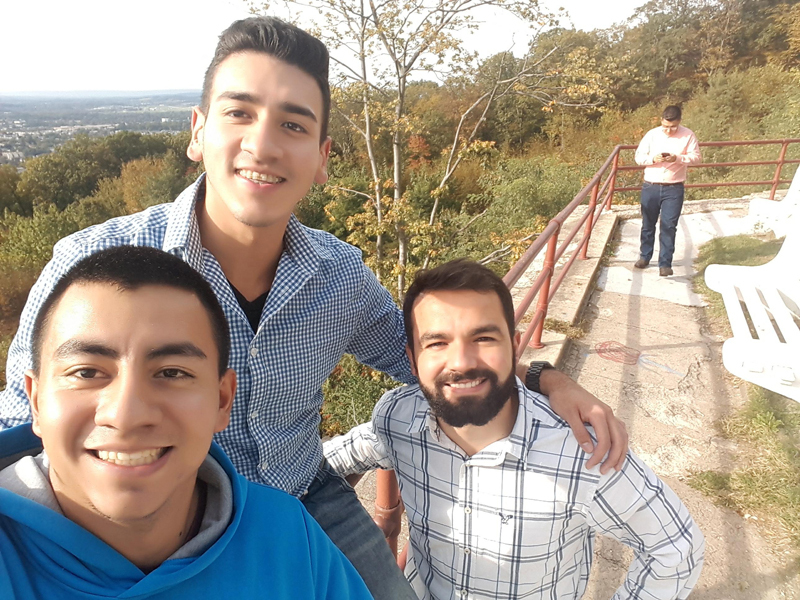 Miguel Ramirez, left, Diocesan seminarian, explores the Pagoda, a historic building atop the south end of Mount Penn overlooking Reading, with fellow seminarians Andres Galeano, center, and Jairo Maldonado.